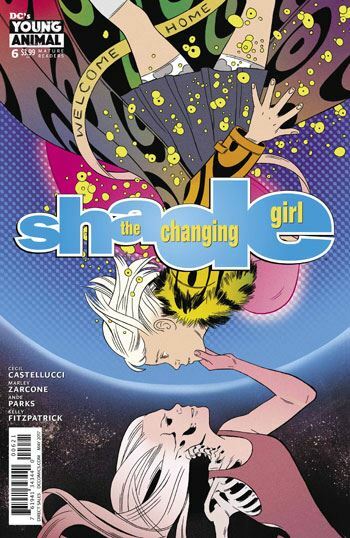 I’ve expressed some concerns about the last couple of issue of Shade, the Changing Girl. Issue 6 is definitely a step up, although my overall feelings about the direction of the book have not changed. 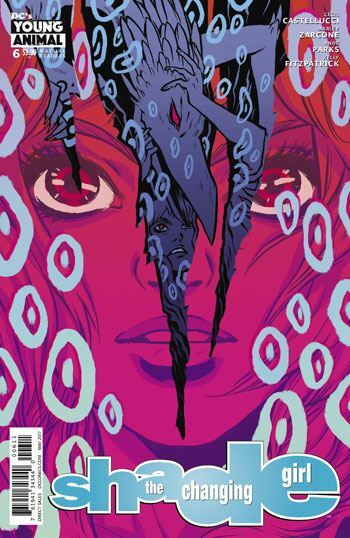 In this issue, Megan comes back, in quasi-ghostly form, and battles Shade for the possession of her body. That alone makes this a far more dynamic issue than the last few. The fact that her school friends wind up seeing the battle, which winds up looking like the girl is simply tripping out or having a breakdown of some kind, is particularly effective. The scenes on Meta are also quite interesting. That plot thread, the attempt to retrieve Shade, and the creation of new agents that will be sent after her, is the most promising part of the book, going forward. It was also good to see Megan judging her friends, and displaying the terrible behaviour that we have heard about for the past five issues. Now we can see that she truly is as awful as we had been lead to believe. The conclusion is satisfying in two different directions, although I really don’t want to reveal anything about it. In some ways, it reminds me of how Troy Grenzer was used in the 90s series. Perhaps the agents from Meta will show up and keep the action going. This book is far better when it’s not completely insular.